Executive condo in marine environment with spectacular views. Welcome to the Eagles Nest luxury suite in Brentwood Bay, located between the Victoria Airport and Victoria on the Saanich peninsula. 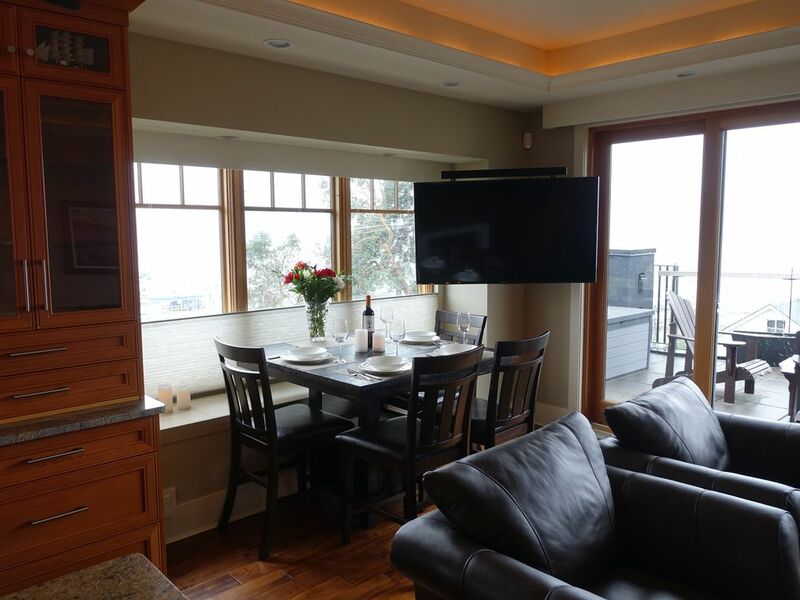 The Eagles Nest is perfect for one, or two couples, or just friends on a getaway. We offer a well equipped gourmet kitchen and amazing views over Saanich Inlet and Brentwood Bay. Two excellent restaurants, a pub, and spa less than a block away. We are down by the marinas and Mill Bay ferry dock in Brentwood Bay, a quaint seaside village on the Saanich peninsula. Being by the Mill Bay ferry is ideal for drivers and cyclists wishing to explore a little further up Vancouver Island after you enjoy Victoria and the Saanich Peninsula. We have truly spectacular patios, the best in the region. Our hot tub is on our huge roof top patio, our gas grill, and fire pit on the large front patio. We have a waterfront path steps from our door with public beach access. Paddle board and Kayak rentals are also just steps away. This is a great area to paddle, and dive. Enjoy amazing views from all main living areas. Wake up to views over the bay from your pillow. Our kitchen includes a double oven, microwave, wine cooler, dishwasher, fridge with ice maker, multiple types of coffee makers, pots and pans, bowls, and dishes, a waffle iron, popcorn popper, and hopefully everything you want. If we don't have it at the Eagles Nest, we will do our best to get it for you. We have a full size washer and dryer and a drawer full of classic games and books. And we have nice tv's if that's how you want to spend some of your evenings including a 60 inch 4k tv in the living room. We offer a 19 plus environment not suitable for children. Our maximum overnight occupancy is 4. We are on the third floor serviced by stairs only. I hope you give The Eagles Nest a try, I know you will love it! Unfortunately, our municipality has recently enacted a bylaw that require me to have a minimum booking of 15 days. My apologies to those of you who wish to book shorter term. It was fun while it lasted, meeting so many interesting people. I have lowered my price t reflect the longer minimum stay. I have owned a retail business in Sidney for nearly 30 years. This condo is a pet project of mine and my partner Dawn Dexter, who has been managing a yacht charter and sailing school in Sidney for a similar time. We are both customer oriented in our day jobs, and aspire to give all of our guests a five star experience at this amazing property. The property and location will take care of most of that. Beautiful very well appointed building, beautiful ocean views, lovely neighbourhood with lots to do nearby on the water and land, charming village flair. The patios are the best in the region, the kitchen is full gourmet if you like to cook on vacation. The building is near new, the furniture is all new for 2018, including the mattresses. toilet, tub, shower, Double sink vanity. This property makes the best of beautiful scenery. Brentwood Bay offers the best views in the Victoria area. Truly gorgeous! Local only. May provide friends or family the number to call in from long distance. Electric heat inside, propane fire pit on front patio. Soap and fabric softener in broom closet. Leather furniture with 60 inch 4k tv, and beautiful views. Drip, french press, or Italian style. Grinder. Everything you are likely to need. Smart HDTV's in living room and bedrooms. Two large patios with great views and sun exposure. Roof patio is nearly 1,000 feet! Third floor stair access only. Brentwood Bay Resort just steps away, has excellent Spa, restaurant, and pub. Butchart Gardens a 40 minute walk away. Easy day trips into Victoria's inner harbour. Perfect base for cyclists. Mill bay and Cobble hill are a short trip on the ferry next door. Great ocean activities in the inlet and off Sidney. Take the ferry to Sidney Spit in the summer, part of our Gulf Islands National parks. Check out the Sidney Thursday night market. Excellent location; very clean and beautifully furnished. Extraordinary attention to details by owner. Thank you Sauli, I appreciate the feedback. It was perfect - not one bad thing! It was more than we expected. The location in amazing, the amenities are high end and everything you would need, very clean and comfortable. Did I say amazing? Thank you Natalie for your kind words. An amazing property with a breath taking views, great location & high end furnishings! The best property we’ve ever rented! Loved the high end furnishings, great location and amazing views! Doug was very accommodating! Lots of great places in the area to explore, including a paddleboard/kayak shop for the calm waters of the Bay, Buchart Gardens, Naniamo River, and China beach. Never ate out as we had a wonderful kitchen to cook in with unforgettable views. Thanks for sharing this fabulous property! Thank you Rhonda. I'm glad we could help make your vacation great! If you are looking for the ultimate luxe accommodation then the Eagles Nest would be IT. Doug provides a fridge stocked with an array of condiments and a pantry with coffees, teas, oil & vinegars & spices. Plush beach towels at the ready on the way up to the hot tub and fluffy bathrobes & slippers for lounging. Fire pit and comfy seating and lounge chairs on the balcony as you star-gaze. Very comfy beds and oh-so-gorgeous ensuite. Doug has spared no effort in making this a top-notch accommodation. I do believe that of all the homes in Brentwood Bay, Doug’s has the most spectacular bay vistas. We will never, never forget this place. Thank you Doug and Dawn for your prep prior to our arrival. Thank you Carmen, I appreciate your compliments. Stunning views in an immaculate well-appointed home! Everything about Doug’s home was first class from the gourmet kitchen to the beds to the outdoor decks! It’s obvious he takes great pride in this home and is very accessible to answer any questions. We thoroughly enjoyed our stay in Brentwood Bay and when we’d come back from the day’s outings it was like “coming home” to a quiet haven. It was a pleasure meeting you. I'm glad you enjoyed your visit. Thank you for the positive feedback. This property is fantastic in every way. The decor, the thoughtful amenities, the view, the outdoor seating areas, the fabulous kitchen with great appliances and the location--all outstanding! Butchart Gardens is a 40 minute walk away.